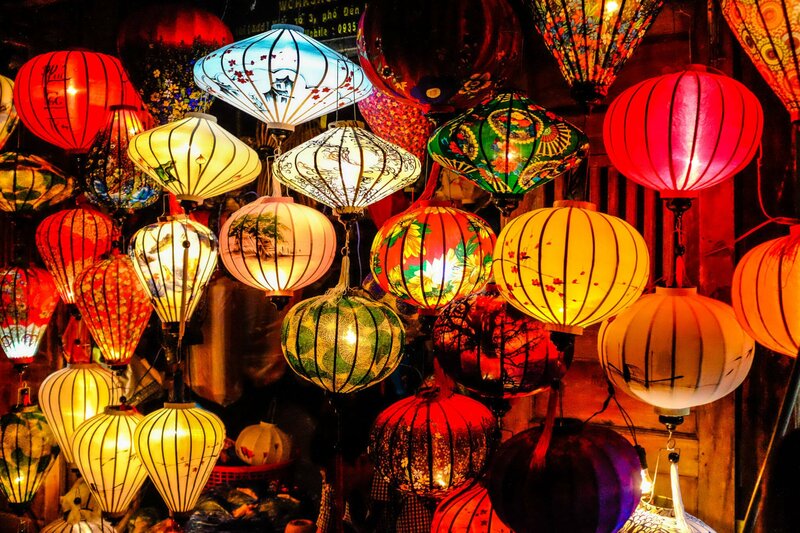 Soon after booking our trip to Hoi An, we realised that the dates of our stay would mean we miss out on one of the cities most famous traditions – the Hoi An Lantern Festival. So with a bit of logistical tweaking, we rearranged our trip to leave Hue one day earlier. This would mean we arrived in Hoi An on the same day that the iconic Hoi An Lantern Festival was taking place, and lengthen our stay in the city by one day. And boy, we were glad we made that change! Hoi An (or Hoian) is a city in Central Vietnam, a beautifully preserved colonial trading port close to the coast. It has not been used as a trading post since the end of the 18th century, having been surpassed by nearby Danang. Losing this strategic importance is the sole reason this lovely city has managed to retain its old-world charm. It meant that Hoi An was able to escape being attacked in any of the 20th-century conflicts that devastated so many other Vietnamese cities. Today, Hoi An Vietnam flourishes as a centre for tourism, as many visitors flock to the UNESCO World Heritage ancient city along the riverside. With colourful streets, a number of historical museums to visit, riverfront cafes along the Hoi An river, and cheap food and drink, Hoi An is a wonderful place to slow down and watch the world go by. The Lantern Festival is one of the most beautiful spectacles in Hoi An. For the Vietnamese people, the full moon festival is a time to pay tribute to one’s ancestors with offerings of fruit, flowers and burning incense (or fake money!) at alters. Monks will hold candlelit ceremonies in the temples. In Hoi An, these traditions have evolved into the Hoi An Lantern Festival as it is today. During the evening of the event itself, all of the electric lights in the Hoi An old town are turned off, and the rivers and street take on a magical aura as thousands of Vietnamese lanterns and candles twinkle and flicker through the darkness. There is no cost to visit the Hoi An moon lantern festival itself. You only need to wander down to the riverfront during the evening. Most of the action takes place around the Japanese Bridge or the bridge that connect An Hoi island to Hoi An ancient city. The ceremonies that take place in the various pagodas are also free to visit. As you wander along the riverfront, you will see literally hundreds of old grannies and young girls plying their trade in moon festival lanterns. One moon lantern only costs around VND 10,000-20,000 (less than $1) if you end up convinced that releasing one of these lanterns into the river will bring you happiness, luck and prosperity. I’m not sure if our relative happiness levels increased after this, but it was a fun thing to do! Although the environmentalist in me wonders where the Hoi An lanterns all wash up at the end. If you want to take a boat (sampan) along the river, then stop and haggle with one of the many locals offering a trip at the floating lantern festival. We did not do this at the moon festival 2017 as we were happy just filming and taking pictures. However, common wisdom seems to tell that you could expect to pay around VND100,000 ($6.50) for a ride. Of course, you need to negotiate and it is probably best to agree on the price before setting off. We battled our way through the throng of people taking selfies on the bridge to get to the south side of the river in An Hoi. There, we saw beautiful stalls selling colourful and decorated lanterns. There are also lots of local food stalls, where you can buy savoury pancakes and sweet treats. How could you possible choose the most beautiful one? We made a short video (around 3 minutes) about our visit to the Hoi An Lantern Festival – click below to see what we saw! The Hoi An Lantern Festival takes place a day before the full moon, which is the 14th day of any lunar month. This is definitely the best time to visit Hoi An! Always check with your accommodation or online to be sure. However, these are the consensus full moon Vietnam dates for 2018 based on my extensive research. Make sure to mark those Hoi An full moon festival dates 2018 in your travel journal! We absolutely adored Hoi An, despite arriving shortly before the Typhoon Damrey arrived! We are planning to do a longer visit at some point, and will definitely take some of the tips from this Digital Nomads Hoi An travel guide. Don’t know what to do during the day? Why not take a cooking class? Check out the post about our Hoi An Cooking School experience. Why not just sitting down and watch some people? Are you considering putting together your own itinerary for a trip to Vietnam? We have fallen in love with this beautiful country and cannot wait to go back. There are still so many things to do in Hoi An. Check out some of our other articles covering our Halong Bay cruise review, and our Ultimate Guide to food in Hanoi Old Quarter. If you wonder where to stay in Hoi An, then our search box below can help you find the best place to stay in Hoi An. You can also read the post about the Best Vietnam Hostels to find some inspiration. We use 12GoAsia for all of our transportation bookings in Vietnam and across SouthEast Asia. They have hundreds of options for flights, buses and trains across the region. You can browse the available transport options for your chosen dates using our search box below. You also can find there how to get to Hoi An. It’s very interesting how far eastern cultures pay tribute to their ancestors. And the idea of the offering. It was the same in Bali. You would wake up in the morning and see the streets strewn with offerings in front of the shops and cafes. You make this festival sound so breathtaking. Sounds like it was worth it to change your flights for it! I love the pictures that you took as well! I have earlier too read about the Hoi-An Lantern festival and it has always fascinated me. But this post is by far the one with the most spectacular pictures. The place seems to have come alive in resplendent colour. I think the atmosphere is like a surreal dream that you have woken up to. You have brought alive the spirit of the festival in vivid colour. That is awesome that you put the dates so one will know when to go for next year. I would love to see this. I love all the colors. Vietnam is certainly a place I would like to see. Hi Holly, we’re happy that we could help you with the dates nd hope you’ll make it next year, it’s absolutely recommendable. What a beautiful tradition and gorgeous festival! I had no idea the origin of this festival was to pay tribute to ancestors. I love this way of staying connected to heritage and the past. Oh your post makes us think about our wonderful time in Hoi An! It’s actually our favourite Vietnamese town! We visited it in 2014 and really loved the atmosphere, especially in the early morning when most tourists were still asleep! haha.. And of course also at nighttime because of all the colorful lanterns, and the delicious street food (even if the town was sooo crowded after sunset!) Since there wasn’t a lantern festival when we were there, we’d love to return just to attend the festival. Thanks for your comment guys! I can fully agree with you – I think if we hadn’t been flooded out of Hoi An, we maybe would have never left 😉 Vietnamese street food is the best in the world – I could live on it forever! You should definitely go back when the Lantern Festival is on if you have the chance. I thought I commented but didn’t go through I guess. This festival of my most favourite thing looks incredible! Definitely going to plan any trip to Asia around this! Thanks for reading! You would not have to plan much – the festival is on almost every month so I’m sure you could fit it in 🙂 The lanterns are so beautiful, positive that you’d love it! So many dates! Seems like any time of the year we are there we will able to witness atleast one of them. Love attending these traditional festivals. These lanterns are so pretty! I’m sure they’re even more lovely in person too. I’d love to see them and all the floating lanterns too! This is so interesting, and love getting involved with a countries traditions. Definitely a wise move to change your departure slightly so you could make the festival. I have to say there are so many similarities with the way Vesak is celebrated in Sri Lanka, again it falls on a full moon in May annually. It is so great to see the different coloured lanterns. Which part would you say you enjoyed about the lantern festival? Thanks for your comment Beverly 🙂 We will be in Sri Lanka but I think we will miss May unfortunately – good excuse to go back! I can say that seeing the lantern stalls with the huge variety of different coloured lanterns, and the streets decked with lights was my favourite part. The floating lanterns were cool but as I said, environmental concerns kind of override the fun a little. Have a great week! Wow, the Lantern Festival looks like a magical experience. All those lights. I had no idea the Hoi An Lantern Festival took place so many times in the same year! I thought it only happened once a year, haha. You learn something new every single day. Thanks for stopping by Rachel 🙂 The lantern festival is a full moon celebration, so luckily we get to experience it more than once a year! Although Hoi An is usually featuring a lot of lanterns all month around anyway, so you wouldn’t miss out if you visited. I didn’t even know that this festival was on 12/13 times a year, thought it was just once a year. Learn something new every day. Great tips on here, hoping to catch this when I get to Hoi An soon. I’m so glad you guys were able to make it to this! These photos and the story behind it are literally giving me goosebumps! It looks like a truly magical experience. What an incredible thing to experience, I seriously have a thing for lanterns so going to have to have to plan around this one and see it for myself! Amazing post! Hi Audrey, thank you so much for reading our post. By now I really know that you love lanterns 😀 We can absolutely recommend you to go there. It’s also very pretty when there isn’t a moon festival. Hoi An is such a magical little town, isn’t it? I’m so glad that you were able to change your plans around to be there for this stunning festival! We were able to participate in the similar festival in Bangkok but their lanterns are made out of bamboo + flowers or food – which made the environmentalist in me slightly happier, but you know those little bamboo boats will be littering the rivers for some time. I definitely would want to see this festival here for myself! Thanks for sharing!